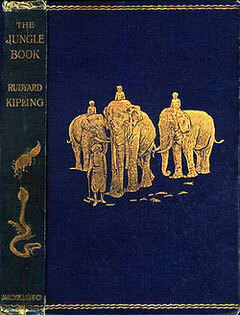 The Jungle Book is a collection of stories written by Rudyard Kipling and published in 1894. The tales in the book are fables, using animals to give moral lessons. For example, the verses of "The Law of the Jungle" lay down rules for the safety of individuals, families and communities. Kipling put in them nearly everything he knew or heard or dreamed about the Indian jungle. The best-known story is about the adventures of an abandoned 'man cub' Mowgli who is raised by wolves in the jungle. The Jungle Book, because of its moral tone, came to be used as a motivational book by the Cub Scouts by Robert Baden-Powell, founder of the Scouting movement. He had asked Kiplings's permission for the use of the Memory Game from Kim in his scheme to develop the morale and fitness of youths. Akela (which means "Alone") is the head wolf, chief of the Seeonee wolf pack and presides over the pack's council meetings. 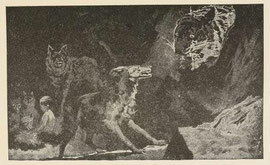 It is at such a meeting that the pack adopts the human cub Mowgli as one of its own and Akela becomes one of Mowgli's mentors. "Akela" has become the name traditionally adopted by the leader of each Cub Scout pack. Raksha (which means "protection") or "Mother Wolf" adopts the human "cub" who has been found wandering lost in the jungle. She names him "Mowgli" which means "frog" because of his hairlessness. She reveals that her name is "Raksha the demon" because of her ferocity as a fighter, and she will fight to the death for any of her cubs, natural or adopted. Baby Mowgli loses his human parents in the Indian jungle during a tiger attack and is adopted by Raksha. 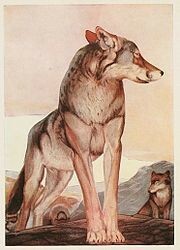 Shere Khan the tiger demands that they give him the baby but the wolves refuse. 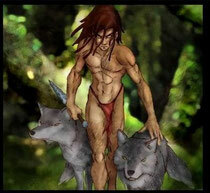 Mowgli grows up with the pack, hunting with his brother wolves. He learns to stare down any wolf but his unique ability is to remove the painful thorns from the paws of his brothers. Bagheera was born and raised in captivity as a pet of the Rajah of Oodeypore in India. He pines for his freedom and, when strong enough, escapes his cage and flees into the jungle. He is ferocious and cunning and wins the respect of all its other jungle inhabitants except the arrogant tiger Shere Khan. When the wolves adopt Mowgli, Bagheera helps to raise him and shares in many of his adventures. 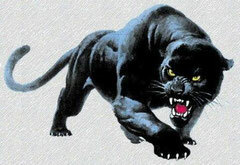 Everybody knew Bagheera, and nobody cared to cross his path; for he was as cunning as Tabaqui, as bold as the wild buffalo, and as reckless as the wounded elephant. But he had a voice as soft as wild honey dripping from a tree, and a skin softer than down. 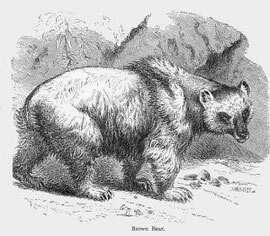 Baloo the bear teaches the cubs of the Seeonee wolf pack the Law of the Jungle. His most challenging pupil is the man-cub Mowgli; despite Bagheera's objections he sometimes finds it necessary to punish Mowgli, although when called upon to defend the man-cub against the Bandar-log he does not hesitate.